This is a glow in the dark flashabou type material. It absorbs UV light and holds it "like a battery" and then discharges its light in darkness. 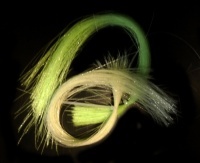 Try it as tags in sea trout flies or as an addition to hairwings, use sparingly. Patches of rabbit pelt in various colours for either cutting into Zonker Strips, or Dubbing.